Prior to its demolition in May of 2003 the ruins of the St. Cyril and Methodius parish off of Van Dyke was Detroit's most haunting ruin; a ravaged but still proud symbol to a community long since moved on. Looking not unlike an ancient Christian ruin, St. Cyrils stood like a monument over a desolate landscape. The neighborhood that once supplied its congregation and student body has physically disappeared. First the people left, then the houses resulting in a vast prairie in the heart of Detroit. 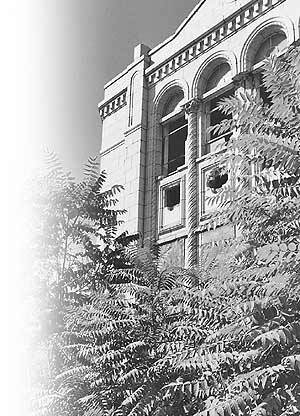 Click below to visit the surreal and tragic ruin that was St. Cyrils of Detroit.